Searching for candidates internally or externally shouldn’t be thought of as an either/or decision; rather, companies should do both. 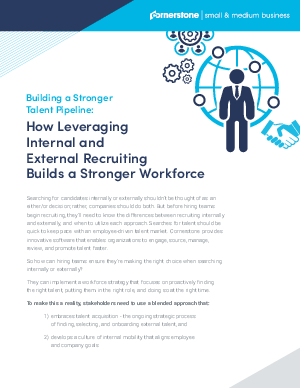 But before hiring teams begin recruiting, they’ll need to know the differences between recruiting internally and externally, and when to utilize each approach. Searches for talent should be quick to keep pace with an employee-driven talent market. Cornerstone provides innovative software that enables organizations to engage, source, manage, review, and promote talent faster.